that's great. i thought for a second it was stirling mortlock he skinned on the outside but on closer inspection i think its stephen moore. shame. lol I love it when a front rower comes out with abit of skill. Although I hear this guy consistently does this kind of thing? Legend. What a run. The best thing about him is that he's really chilled out and humble about the whole thing. A very likeable guy. I've been in the stadium when the roar of BEEEEEST goes out and it's really awesome. Kids, wives, it's fun for everyone. Adds to the occasion. The game of rugby need more characters like the Beeeast. as Ace Ventura once said, OH AH OH AH, OH AH SHIKACKA!!! man so many amazing zim born players. if they had the proper training in zim, players like him and chavanga wouldnt have to go to SA to pursue rugby and zimbabwe would be a great team! 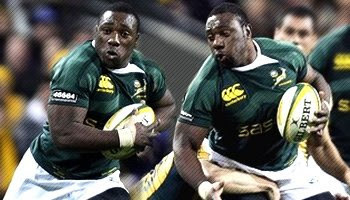 howzit, nice to see there are other zimbos on this site!What a pity zims talent has to ply thier trade in other countries, we could have a talented team with the likes of the beast,mujati,chavanga,ngwenya to name a few, even pocock the western force flanker is zim born. Who needs Tonderai Chavanga when yo got beast! Garvey, Skinstad... there's a few who could have done well with Zim. Proud to wear the jersey of his adopted country, and making his adopted country proud. Bad defence??! Just like whenever your favourite player scores a try or makes a good run eh? Nothing like being a hater. A 115kg powerful prop would hand most players off. Bad defence my arse. Hope to see Beast in action on the SA leg of the Tri Nations. Should be good. wait till u see him with the ball in hand during the SA leg of tournament. the crowd wil go mental!! got gas because he used to be a flanker right? isnt meant to be since he was 8 or 9? Thanks bd.. late night typo. I think the beast is a legend but will he be picked during the SA leg of the tournament? I assume they've been picking Mujati on the bench because he's able to cover both sides of the scrum but surely the beast is a way better loose head. Does anyone know if Steenkamp could cover the tighthead side if van der Linde had to be substituted? He looks really fast for a man of his size... great runs. i bet he was bigger at 8-9 than i am now ... i thought his nick came from commentators not being able to say his name ... Mtawarira ...hmmm how do you say that? great runner, great ball carrier (he was a backrower, right? ), and of course a great prop! He's going to be a great star of South Africa! I think S.A. people need it! Speaking of Zims, where is Kennedy Tsimba these days? I guess he's like 34-35, so perhaps retired. I always liked his play, and felt bad that he was boxed out of most test rugby. Back in his day, the tipping point of BS in Zim wasn't as clear. It seems that for these younger guys (born in the early 1980s), they were young enough to move to ZA to build their skills. (Albeit at a much lower frequency), this is the same issue which many of the Pacific Island nations face with NZ and AUS. Many of the best schoolboys have to leave the islands to become the best players they can. Cuck that this video is now copyrighted. Seriously... a short video clip showing some greatness being copyrighted? What's the purpose?